I have a love/hate relationship with freezing food. I almost completely avoid freezing anything because I rarely get around to eating it before it gets dehydrated and oxidizes – aka freezer burnt. I’ve pulled a few things out of my freezer recently that were almost unrecognizable and it pains me to have to throw food away. Until about a month ago, my method of avoiding freezer burn was to simply NOT freeze anything. 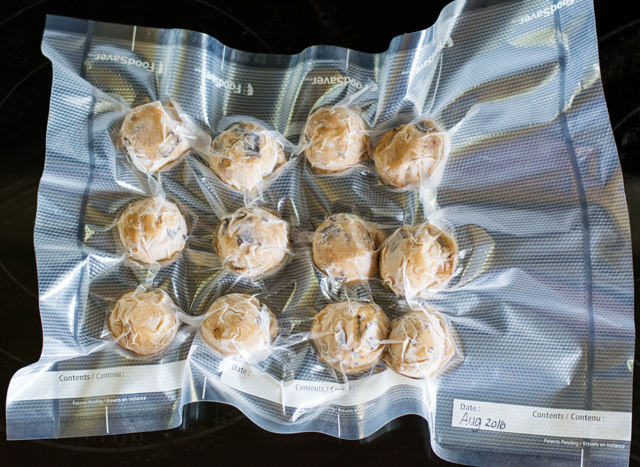 That was until I was offered the chance to test out the FoodSaver Vacuum Sealing System – a fast and efficient sealing system that creates air-tight bags, and re-usable containers. I have two words for you – Life Changing. I was sent the FoodSaver® 2-in-1 Vacuum Sealing System for review about a month ago, and ever since, I’ve been vacuum sealing pretty much everything. The kit included a FoodSaver Roll (to make custom bags), 5 pre-made bags, 5 zipper bags, 1 re-usable container and 1 bottle stopper. The system came fully setup, and all I had to do was plug it in and start sealing. The sleek, compact design fits well in my tiny kitchen where counter space is hard to come by. Not only that, but it’s one of the most user-friendly gadgets I’ve used. At the touch of one button, I was sealing one side of my first custom bag. I filled it with raw cookie dough, and with the press of one more button, I was effortlessly vacuum sealing the bag. Bam! Popped those suckers into the freezer for future cookie cravings. I used to buy chicken in bulk because it’s cheaper than buying two at a time, but I stopped because they were getting freezer burnt before I could eat them. I’m no longer afraid to put my chicken in the freezer. 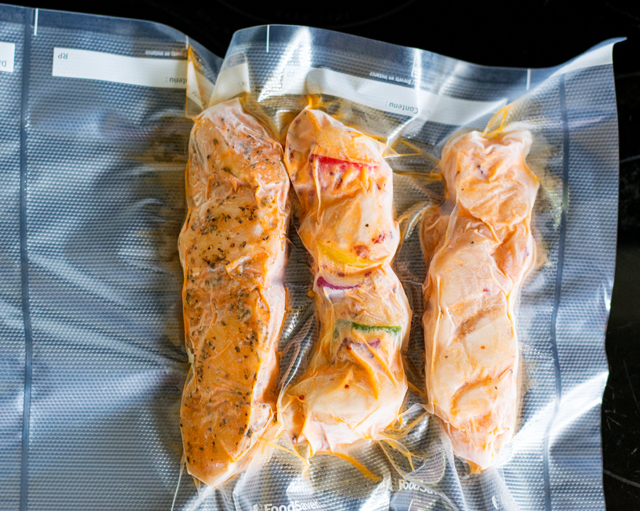 I vacuum sealed three marinaded kebabs that were leftover from a bbq. I knew I wasn’t going to eat them anytime soon, so I sealed them and tucked them safely into the freezer. I just pulled them out this last weekend, (about a month later) thawed and bbq’d them and they were just as perfect as the day they were made. One of the things I love most about the FoodSaver System is that I’m not restricted to freezing food in bags. I’ve used it to reseal bags of chips and crackers! Just be sure to press the Seal button, or else the machine will try to vacuum seal the bag and crush all those precious chips. 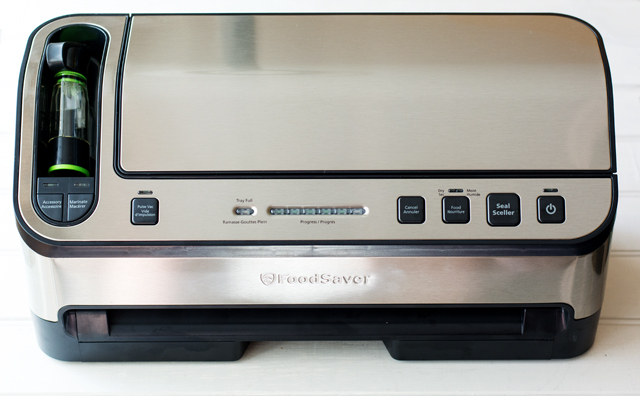 The FoodSaver is going to be my saving grace once I harvest my garden this fall, and for all the perfect veggies I plan to buy at the farmers market. I’ve already frozen yellow beans and rhubarb for future use. I’m quite pleased with the idea of keeping my food fresh for up to five times longer than I normally could keep it. Overall, I love using the FoodSaver System. I will admit at first I was concerned about waste, however their website says the bags are BPA free and recyclable which is a huge bonus for me. The machine was super easy to use, with easy to follow instructions. What I love most is that I can now keep food fresher, longer and I don’t have to worry about sticking stuff in the freezer to die! Disclaimer: The FoodSaver was provided to me at no cost in exchange for a review. All opinions are my own.